Varnished, tongue-and-grooved deck is surrounded by a 2" x 2", 1/8" thick steel frame. Removable pipe handle. 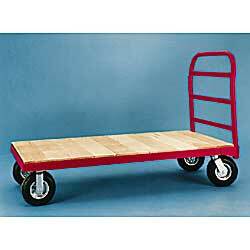 SPECIFY CASTERS: A - 5" polyolefin, 2,600-lb. cap., B - 6" gray non-marking, 1,640-lb. cap. ; C - 8" mold-on rubber, 2,000-lb. cap. ; D - 8" full pneumatic, 1,200-lb. cap. ; E - 10" full pneumatic, 1,500-lb. cap. IN STOCK. 6" gray non-marking, 1,640-lb. cap. 8" mold-on rubber, 2,000-lb. cap. 8" full pneumatic, 1,200-lb. cap. 10" full pneumatic, 1,500-lb. cap. Corner and handle bumpers are available, call for more information.